Iota Localization Services - E-learning localization — what’s in it for me? From a functional perspective, the ultimate objective of any localisation project is to ensure your e-learning assets share a common look, feel, and level of functionality across the locations in which they are to be used. Localisation should ensure your learning objectives are met regardless of the language, culture and location of your learning community. 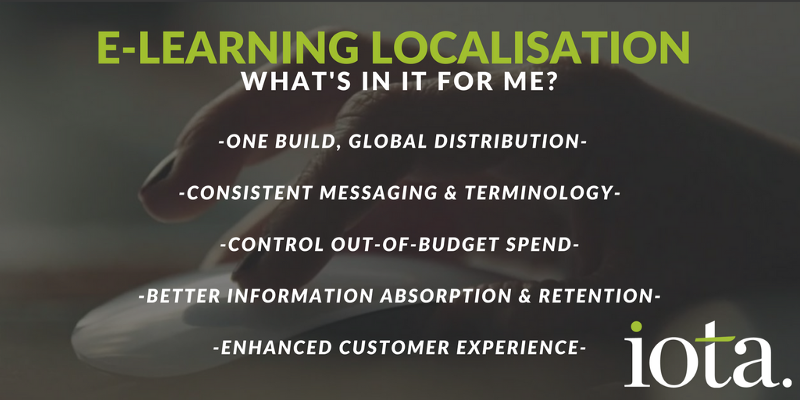 So, what are the top 5 benefits you can expect to see from localising your e-learning content? There’s a lot to be said for creating a single e-learning programme and then adapting and localising it for all the locations you operate in. Whilst the initial investment is likely to be significant, it generally requires a single set of subject matter experts, one development platform, and delivers many associated benefits. Most of the cost in setting up an online programme will only be incurred once, rather than multiple times if developing custom training in-country. In summary, it’s an efficient and cost-effective route to take. By developing a standardised learning programme you can ensure that corporate policy is shared consistently across globally dispersed teams. Sales methodologies, internal processes, and regulatory requirements can all be applied consistently and reliably — significantly reducing risk in the process. In regulatory environments, a centralised audit trail can be a business-critical requirement. Costs are reduced if local offices don’t need to develop their own custom training for in-country teams. Centralised provision of learning resources allows you to maintain full visibility and control of scope and budget, without fragmentation of resources and the potential for escalating costs. Teams absorb and retain information more effectively if it is delivered in their native language. Even for those who speak English as a second language, training delivered in their first language will deliver better learning outcomes. Case studies and interactive training are also far more effective when they are adapted to reflect local conditions and cultural norms. After all, even a simple business meeting will be conducted very differently in Japan to how it is conducted in the United Kingdom or North America. By providing a consistent training approach across all areas of operation, quality is maintained and the customer experience is enhanced. Customers of all kinds expect a global organisation to deliver the same level of customer service wherever they operate. Localised training gives you the opportunity to embed and monitor best-practise standards across all your global locations. Localisation of your e-learning assets can deliver significant cost-savings and wider corporate benefits. If you’d like to discuss how your organisation can take advantage of a centralised approach to global training, get in touch and we’ll be happy to help.